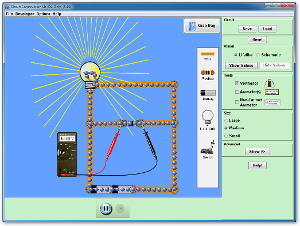 Use the simulation applet below to build and investigate the circuits in the Ohms Law lab, Part 1 and Part 2. After you have collected the data in the virtual lab, build some of the same circuits with the kits and measure the voltages, resistances, and currents with the multimeter. Account for any discrepancies you find. If you prefer to do this "hands on", you can use one of the SnapCircuit kits to perform the experiments in the Ohms Law Lab.